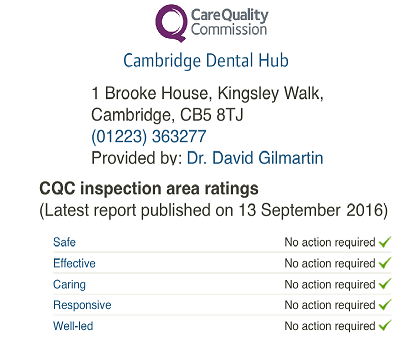 1d Brooke House, Kingsley Walk, Newmarket Road, Cambridge, CB5 8TJ. We realise that fears and phobias about visits to the dentist are many we have to and varied. We encourage nervous and phobic patients to contact us beforehand, an email is fine, and let us know in advance of their first appointment. Please let us know if you are nervous, whether in general at every visit or just on a particular visit. Some patients are OK for everything except perhaps one thing. We really enjoy helping people get over their nervousness. We understand that all people are different and so are their anxieties. Some patient simply hate the smell or noise but for others it is far more complex. First of all - don't feel embarrassed - a very large proportion of the population is nervous of treatment. We want to help you - over the years we have had many successes in helping people get over their fears about dentistry. We have also learnt that there are patients we can't help and we have built up options for them as well. We have dedicated and regular staff training, including role play, to help all our staff to deal better with patient anxiety and fear. We have designed our surgery to be more relaxing, we have also trained our staff to listen and understand the patients needs. Relaxed Dental Care Caring for Nervous patients is what we do best. We have years of experience treating people who are terrified. No matter how you feel, rest assured we have seen somebody more nervous than you. Some of our patients who have moved away from Milton Keynes return to visit us from all over England for a wide range of treatments. The fact that you are even reading this means that you recognise or experience the the problems associated with Dentist Visits. Perhaps you are looking on behalf of a nervous friend or family member. Firstly we realize that there are lots of patients who will never be able to have treatment while they are awake and we are happy to either offer them Sedation at our practice (see below) or refer these patients to the hospital. Some patients are often in tears just standing at the dental reception. We also realize that some patients simply need more time, careful explanations and a bit of understanding. Usually all that patients need to relax is to know that we understand their fear and that they are in control. If at any point either before or during treatment, you want us to stop - just let us know. Let us Know the aspects of dental care that upset you. Fear of the dental surgery has always been a major factor in keeping many patients requiring treatment away from the dentist. At our practice we provide the support of a caring and sympathetic clinical team in a relaxed, friendly environment in which your dental needs can be met with minimum anxiety or worry to you. We have created an environment allowing us to break down many of the barriers which lead to the fear of attending the dentist. This includes a the opportunity for you to come in for a coffee and discuss any concerns you may have about your dental treatment. Dental health is an important component of overall health, but dental phobia, dental anxiety, dental fear, and fear of needles or anaesthesia are major obstacles to receiving proper dental care. Dental phobia is the serious, often paralysing, fear of seeking dental care. It is one of the reasons many people avoid visiting the dentist, and it can therefore have serious consequences for dental health and overall well-being. To enable you to visit the surgery we can provide you with a tablet to take, to help relax you. We offer Dental Sedation where patients can have intravenous sedation with a qualified and experienced anaesthetist providing the sedation. For people with a fear of needles, a surface anaesthetic can be provided to the back of the hand. You will be required to come half an hour before your appointment for this to be applied, as it takes time to work. When calling to make an appointment, do not be embarrassed to explain you are a nervous patient. Our receptionist will support you through your visit to our clinic. Once you are with the dentist, explain what makes you anxious - different things affect different people, so talk to us. It is our aim to provide you with the best possible care. Appointments for Sedation are normally available within a couple of days and sometimes the same day. We offer sedation for all treatment, from the longer appointments like Root Treatments or multiple restorations to short visits for simple extractions or Hygienist visits. The cost of sedation depends on the time taken for the sedation. Sedation at our practice is carried out by Dr Etienne Deysel who is a fully medically qualified Sedationist. Sedation is not suitable for all patients, and we may need to refer you to a Specialist Centre. We will start with making you comfortable and gaining your trust. Do not be afraid to ask questions. Once you are with the dentist, explain what makes you anxious - different things affect different people, so talk to us. It is our aim to provide you with the best possible care. If dental treatment is required, remember, explanation and clarification of any and all procedures proposed are part of the service. It may help you to eat a light meal prior to your appointment. An empty stomach can increase anxiety, while a full stomach is more relaxing. tea, coffee, etc. should be avoided, as these are both stimulants. In your initial discussions with the dentist, agree a stop signal to be used during treatment. This could be, for example, raising your left hand. This will allow you to retain complete control throughout the procedure. Etienne gained his MBChB from the University of Pretoria, South Africa, in 1989 and spent ten years in general practice. He was involved with two anaesthetic day clinics and two private A & E Units whilst in South Africa. In 2003 Etienne was awarded the PDD.SED (Post Graduate Qualification in Conscious Sedation and Pain Control) from University of Stellenbosch, South Africa. Etienne is registered with the GMC (registration number 4562333) and South African Health Professions Council. Etienne is a Member of the Society of Conscious Sedationists UK and the Society for the Advancement of Analgesia in Dentistry. Your First Appointment as relaxing as we can. You can choose to make an appointment just for a chat. You don't even have to sit in the dental chair! We will learn exactly what your worries are. That you are in control at all times. If at any point in the conversation you just want to get up and leave - you can and we won't be offended. That when you call to make an appointment, you will not be embarrassed to explain you are a nervous patient. Our receptionist will support you when you contact our clinic. That we show you as much or as little as you want. That you can have input into the treatment choices and decisions. What is the difference between GA and Sedation? In the past GA was frequently prescribed to carry out dental procedures while the patient was unconscious. This option has been banned from general dental practice by the Department of Health from the end of 2001. During the past few years sedative drugs and techniques have been developed which have eclipsed the need for GA in dentistry. During sedation the patients are conscious but they are not aware of any pain and have no recollection of the dental procedure. This technique is very safe when carried out by a well trained Sedationist and his team in appropriate surroundings. With sedation, the patient breathes for himself and does not suffer the ill effects of GA, nausea, muscle pains and sore nose and throat. I am scared of needles, what can you do to minimise this fear? Before you attend our clinic you can go to your GP and tell him/her of your concerns. He may prescribe you some Ametop or EMLA cream which contains local anaesthetic solution and applying this to your hands one hour prior to your dental visit will numb you hands so that you will not feel any sensation during cannulation. On your arrival at our clinic notify our receptionist who will let the Sedationist know. The Sedationist may ask you to inhale a mixture of nitrous oxide and oxygen gasses (similar to the Entonox women use during childbirth) to make them feel more relaxed before inserting the cannula. While I am sedated, will I be able to hear, feel or see anything? You will be able to hear things as verbal contact must be maintained – as per the GDC definition of conscious sedation. If we ask you to take a deep breath, you will respond, but you will not remember this and none of what is occurring will worry or trouble you. You may not be able to see anything as we cover your eyes with protective glasses and patients frequently feel so relaxed that they fall asleep during treatment. Your mouth is numbed up as usual in the dental surgery but you will not be able to recall this happening and the dental treatment will proceed while your teeth and gums are completely numb so that you won’t be able to feel anything. This depends largely on the amount of sedation and the amount of dental work that you have received. This also depends on your metabolism of the sedative drugs used in your sedation. Typically most patients have left the premises within 45 minutes of going into our recovery facility where a trained nurse will supervise your recovery and give you your postoperative instructions. Intravenous sedation is the administration of a tranquiliser drug into the blood system in order to facilitate dental surgery in the highly anxious patient. The drug is injected into one of the superficial veins of the arm or hand. As the vein is usually just under the skin and the cannulas (a small plastic tube) used today are extremely thin this is usually quite painless. This technique produces a feeling of relaxation and sleepiness. Treatment can then be carried out by using the normal local anaesthetic which is given as needed during treatment. Even the most highly anxious patients can be successfully treated with this technique. Most patients experience either full or partial memory loss of the dental surgery. The vast majority of patients are medically able to have sedation. Although some medical conditions rule it out as an option(severe lung diseases, some heart problems or uncontrolled high blood pressure). As opposed to general anaesthesia the patient remains conscious but deeply relaxed throughout the surgery. Thus the potential dangers of general anaesthesia are avoided. A great deal of research has been carried out on this subject and so long as the sedation is carried out by a dentist, Sedationist or anaesthetist who is trained and experienced in the technique it has been shown to be extremely safe.